Add a touch of creative sparkle with these fabulous glitter pens from Spectrum Noir. Available in a range of on-trend, seasonal colors containing fine glitter micro-pigment, and featuring a flexible nylon brush for accurate, mess-free application, these pens are perfect for coloring, writing, embellishing, accenting and more! 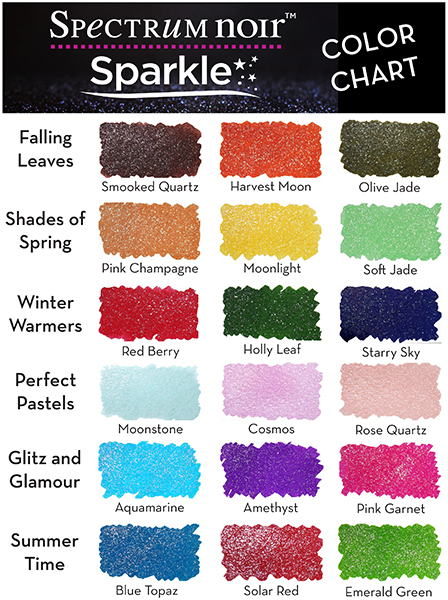 There are a variety of gorgeous colors plus a 'Crystal Clear' glitter topcoat available for applying over existing color. Water reactive, so you can watercolor with them as well. Use the Clear Overlay pens on top of existing color to create a gorgeous sparkle!